Starting with the SharePoint Framework v1.8, you can also implement your Microsoft Teams tabs using SharePoint Framework. This significantly simplifies Teams tab development process as SharePoint Framework web parts are automatically hosted within SharePoint without any need for external services. This lab requires that you are using at least version 1.8 of the SharePoint Framework as these capabilities are not available in earlier versions. Accept the default teams-tab-webpart as your solution name, and then select Enter. Select SharePoint Online only (latest), and then select Enter. Select Use the current folder as the location for the files. Select y to ensure that your web part is automatically deployed tenant wide when it's added to the tenant app catalog. Select N on the question if solution contains unique permissions. Select WebPart as the client-side component type to be created. Enter MyFirstTeamsTab for the web part name, and then select Enter. Enter My first Teams tab as the description of the web part, and then select Enter. Accept the default No JavaScipt web framework option for the framework, and then select Enter to continue. At this point, Yeoman installs the required dependencies and scaffolds the solution files. This might take a few minutes. Yeoman scaffolds the project to include your MyFirstTeamsTab web part as well. Starting with the SharePoint Framework v1.8, scaffolding will also include additional ./teams folder in the solution structure, with default configuration for your web parts, so that you can get started with Teams tab development as easily as possible. These images will be used as icons in Microsoft Teams. Locate the manifest json file for the web part you want to make available to Teams and modify the supportedHosts properties to include "TeamsTab" as in the following example. Open src\webparts\helloWorld\HelloWorldWebPart.ts for the needed edits on making our solution aware of the Microsoft Teams context, if it's used as a tab. Add the following private variable inside the MyFirstTeamsTabWebPart class. We will be storing information around the Microsoft Teams context in this variable. Add new onInit method inside of the MyFirstTeamsTabWebPart class, just below the private variable, which we just added with following content. Update the render method as follows. Notice how we are rendering different content dependent if the code is rendered as a tab in Microsoft Team or as a web part in SharePoint. 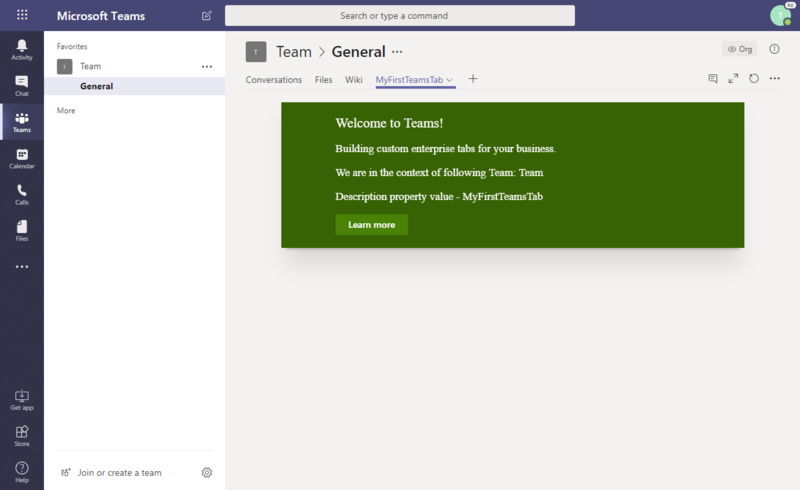 You can find full description of the information available through Microsoft Teams context for Microsoft Teams tabs from the Microsoft Teams developer documentation. Ensure that your console is activated in the root folder of the solution, which was just created. Execute the following commands to build bundle your solution. This executes a release build of your project by using a dynamic label as the host URL for your assets. This URL is automatically updated based on your tenant CDN settings. Execute the following task to package your solution. This creates an updated teams-tab-webpart.sppkg package on the sharepoint/solution folder. Next, you need to deploy the package that was generated to the tenant app catalog. If you do not have an app catalog, a SharePoint Online Admin can create one by following the instructions in this guide: Use the App Catalog to make custom business apps available for your SharePoint Online environment. Go to your site's app catalog. Upload or drag and drop the teams-tab-webpart.sppkg to the app catalog. This deploys the client-side solution package. Because this is a full trust client-side solution, SharePoint displays a dialog and asks you to trust the client-side solution to deploy. Notice how the domain list in the prompt says SharePoint Online. This is because the content is either served from the Office 365 CDN or from the app catalog, depending on the tenant settings. Ensure that the Make this solution available to all sites in the organization option is selected, so that the web part can be used from the Microsoft Teams side. Notice that you can see if there's any exceptions or issues in the package by looking the App Package Error Message column in the app catalog. Now the web part is deployed and is automatically available cross the SharePoint Online sites. 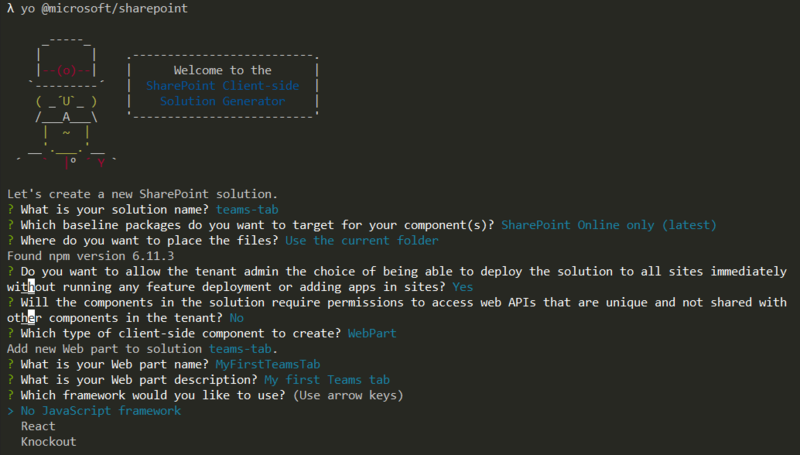 In this tutorial case, we are using tenant wide deployment option of the SharePoint Framework solution. This will ensure that the development and usage experience is as easy as possible. 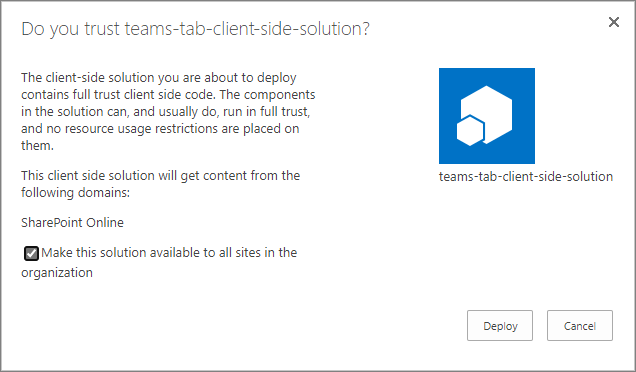 You could also deploy the solution as site scope, but in that case you'd need to ensure that the solution is deployed on the SharePoint site behind of the Microsoft Teams, before you can use it. In order to make your web part available in Microsoft Teams you will have synchronize your solution with teams. Create a Microsoft Teams app manifest file by following the instructions detailed here: Create Microsoft Teams manifest manually for a web part and deploy it to Microsoft Teams. 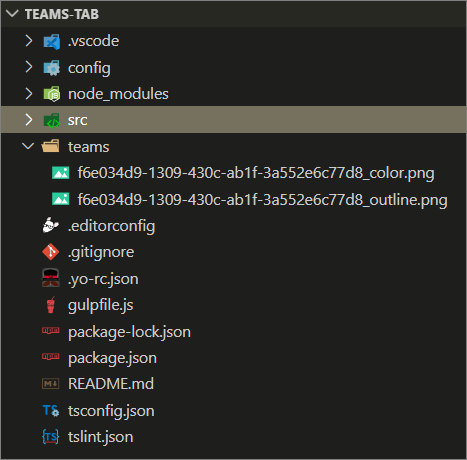 Create a Microsoft Teams app package by zipping the contents of the ./teams folder. Make sure to zip just the contents and not the folder itself. This ZIP archive should contain 3 files at the root: two images & the manifest.json. Select the Microsoft Teams application ZIP file previously created. This is the file that contains the manifest.json and two image files. After a moment, the application will appear next to your tenant name. You may need to refresh the page for the app to appear if you are using the browser Microsoft Teams client. Your custom tab has been added on the Microsoft Teams channel and you can see how the code is reacting that it's in Microsoft Teams context. Theme of the web part is by default coming from the underlying SharePoint site.